“Yacht paint” (or boat paint) is the umbrella term for all the coatings used as protection and decoration on all parts of a yacht. Above and below the waterline there are a wide variety of coatings working hard to keep your yacht looking and performing its best. These coatings include primers, undercoats, topcoats, varnishes, fouling control, coatings for propellers, topside paints, bottom paints… with so many options, it is easy to feel all at sea. Whether you have a dinghy, canoe, row boat, motorboat, speedboat or yacht, you need to look after your vessel to make sure you get as many good years as possible on the water. A vital part of boat care is the choice and application of boat paint. In this guide we will take you through the best boat paint systems for GRP/FRP, aluminum, steel, and wood, and provide you with the tips and tricks to ensure a job well done.We also look at some of the top yacht paint manufacturers and products available in the US. A boat paint system is designed with the substrate material, environment, and use conditions in mind. For most applications and coating layers, coating companies will provide a single pack/component and two pack/component option. These options vary not just in difficulty but also in coating strengths. Below is a chart comparing some of the properties of one and two component boat paint systems. Yacht paint that is meant for all surfaces above the waterline is known as topside paint. These coatings are subject to temperature fluctuation, everything the weather can throw at them –from rain and hail to burning sunshine– and all the perils of extended periods on the water. Primers and undercoats – These protect the boat’s substrate, combat problems like osmosis and corrosion, provide the perfect surface for and enhance the final finish. Topcoats – The coat that you see. Designed to protect against the elements and enhance the appearance of your yacht. Fillers – Used to streamline a surface and fill in blemishes and fairing the surface of a boat. Improves hull performance. Deck coating – Coating designed for durability and work. They are mostly matte, to reduce reflections, and can be non slip for safety. Paint for bilges and lockers – Protects against moisture penetration while also resisting oil and fuel spills. Easy to clean and durable. IBEX, the largest marine industry trade event in North America, yearly provides awards to industry members that reward ingenuity and excellence in the field. Called the ‘Innovation Awards’, they are one of the industry’s most prestigious honors. 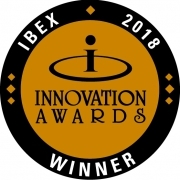 At IBEX 2018, the Innovation Award for boat care and maintenance went to Awlgrip (from AkzoNobel) and their new Quick Build Sealer and Quick Build Surfacer. Awlgrip Quick Build is a versatile, quick-drying multi-color priming system made up of a surfacer and a sealer. Six color bases can be used with Quick Build Sealer or Surfacer converter and activator, giving the customer the choice between a quick non-sanded sealer system or a sanded surfacing system. It saves time and money throughout the painting process for small to large fiberglass and aluminum boat manufacturers and component suppliers, boatyards, and professional applicators. Below is a look at some of the top topside coating products available in the US. Hempel PolyGloss 2 component polyurethane enamel A high gloss coating especially suited for application with a brush. Excellent gloss and color retention with high durability. Steel, aluminum, fiberglass, and plywood. For interior and exterior use above the waterline. International Perfection 2 component polyurethane topcoat Long-lasting, high gloss topside paint with UV filters, superb color retention, abrasion and chemical resistance. Aluminum, zinc-galvanized steel, epoxy composite, carbon fiber, GRP/FRP, wood. Hull, deck, bilge and lockers, exterior and interior cabin and trim. Fouling control coatings, or bottom paints more generally, are those applied below the waterline to protect the hull, keel, and propeller from both the dangers of osmosis and corrosion and from the build up of organisms, known as fouling. 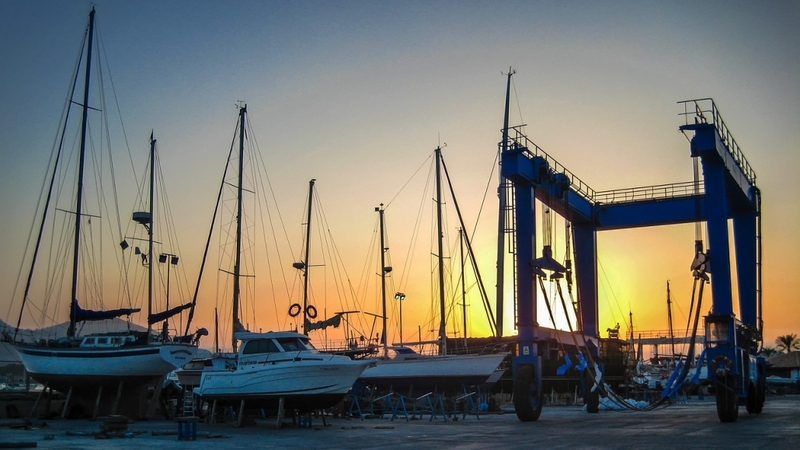 Antifouling works by releasing biocides to kill off or deter organisms, or by making the surface too smooth to adhere to as with foul release coatings. Hard antifouling – A coating system where the biocides are slowly leached from a hard and durable resin at a slowly decreasing rate of efficacy. Eroding antifouling – This category also includes self-polishing or ablative antifouling. This system is designed to wear away at a controlled rate, continually exposing a surface of fresh biocide. This may be through a reaction with saltwater, or through erosion. Fouling release – The biocide-free alternative to antifouling which uses physical properties like extreme smoothness to prevent the adherence of organisms and slime. Propeller coating – The propeller is an area which experiences excessive wear and tear, so antifouling and propeller coatings need to be extremely high endurance. The factors that affect the choice of bottom paint are the yacht type, the sailing pattern and speed, the geographic location (warm or cool waters, particularly) and the type of mooring, and the environmental legislation of the region. Hempasil X3+ Foul release coating A biocide-free, two component, high solids content fouling release based on silicone hydrogel. Self-cleaning and best for vessels with service speeds above 8 knots. Can be used on any type of propellers, power plant water inlets on pipes and grates. International Micron 350 Self-polishing antifouling A self polishing antifouling for outstanding performance in sea water, fresh water and brackish water. Quick-drying, easy to apply, and extremely durable. Provides protection for 2 years even while stationary. Epoxy composite, carbon fiber, cast iron, GRP/FRP, lead, steel, and wood. Jotun Megayacht Imperial Antifouing Self-polishing anitfouling A specialist megayacht formulation which is both self polishing and self smoothing with proven 36 month fouling free performance even in the Arabian Gulf and Caribbean. Aluminum, carbon steel, composite and wood. Time and the elements will, over time, drain your woodwork of its gleam and color. Left uncared for, wood is susceptible to mold, fungi, sealife, and rot, and if you aren’t careful there may not be much left to restore. With the right yacht coating, wood can be protected and enhanced. Whether your craft has oak, mahogany, marine ply, pine, teak, cedar or any other wood, coating is needed to keep it at its best. Wood varnish for yachts is particularly tough, UV resistant, durable, and available in a variety of chemistries, though most of these are phenolic, alkyd or polyurethane. When it comes to varnishing brightwork, the best way to keep it sparkling is with a spar varnish. Are you looking for the best yacht paint supplier? Get in touch! Our experts are here to answer all your yacht paint questions and connect you with the right coating and company for the job. Just use the “Request a Quote” button beneath the article and use our free quotation service to get underway. Awlgrip Awlspar Varnish Amber phenolic tung oil varnish Used for brightwork protection against deterioration and abrasion from water and weather. Rich color and deep gloss. Hempel’s Classic Varnish Clear, high gloss alkyd varnish containing tung oil A flexible and long-lasting finish for use on new wood as well as previously varnished wood in the interior and exterior. Resistant to seawater, sunlight, and weather. International Goldspar Satin Satin finish polyurethane varnish Designed for interior use, resistant to hot water, mild acids and alkalis, with a quick drying formula.